Lieh Jeng joined the group in October 1993 after completing his first degree and his Masters in Taiwan. His arrival coincided with the discovery of the rare earth nickel boron carbides, a new class of magnetic superconductors, and so he immediately began working on these materials. Lieh-Jeng graduated in February 1997. Lieh Jeng is currently a Professor in the Physics Department National Cheng Kung University. 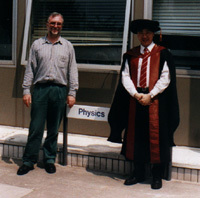 Lieh Jeng with Don Paul outside the Physics Department on graduation day. Polycrystalline samples were prepared using an argon arc furnace. Later, single crystal samples were grown using a flux method. The samples were characterised by x-ray diffraction, resistivity and ac susceptibility measurements. An apparatus was constructed to measure the thermopower of the borocarbides other materials between 1.5 K and room temperature. Neutron diffraction measurements were performed at ORNL, USA, Risø in Denmark and at the ILL in France. The magnetic structures of many R-Ni-B-C (R=rare earth) compounds were determined using neutron diffraction techniques. These compounds include the magnetic superconductors RNi2B2 C (R=Dy, Ho, Er and Tm) and the magnetic materials TbNi2B2C, HoNiBC and ErNiBC which are not superconductors. Commensurate magnetic structures are only observed in the compounds HoNi2B2C (T<8.5 K), DyNi2B2C (T<10 K) HoNiBC (T<10K) and ErNiBC (T<4.5 K). Incommensurate magnetic structure were observed in HoNi2B2C (modulated along the a axis (5 <T<7 K) and the c axis (5 < T <8.5 K) directions), ErNi2B2 C (modulated along the a axis (T<7 K)), TmNi2B2C (modulated along the 110 direction (T<1.5 K)) and TbNi2B2C (modulated along the a axis direction (T<15.5K)). The magnetic structures of some doped HoNi2B2C compounds were also investigated due the complex structure of pure HoNi2B2C. Ho0.9Y0.1 Ni2B2C shows a helical structure lying on the ab-plane whilst Ho0.95La0.05Ni2B2C shows a helical cone magnetic structure (helimagnetic configuration in the ab-plane plus an antiferromagnetic configuration along the c axis). The structural magnetic and transport properties of Pr 0.6(Ca xSr 1-x) 0.4MnO 3. M.R. Lees, L.J. Chang, J. Barratt, G. Balakrishnan, C.V. Tomy, D. McK. Paul, C.D. Dewhurst and C. Ritter, SCES, Zurich Switzerland, 1996. Physica B 230-232, 313 (1997). The nature of magnetic ordering in TbNi2B2, C.V. Tomy, L. J. Chang, D. M. Paul, C. Ritter, Physica B 230, 872 (1997). Magnetic structure of TmNi2B2C, L. J. Chang, C. V. Tomy, D. McK. Paul, C. Ritter, Physical Review B-Condensed Matter 54, 9031-9034 (1996). Neutron diffraction studies of Ho1-xYxNi2B2C compounds, L. J. Chang, C. V. Tomy, D. McK. Paul, N. H. Andersen, M. Yethiraj, Physica B 224, 119-122 (1996). Magnetic order in HoNiBC and ErNiBC, L. J. Chang, C. V. Tomy, D. M. K. Paul, N. H. Andersen, M. Yethiraj, Journal of Physics-Condensed Matter 8 , 2119-2125 (1996). Neutron Diffraction From HoNi2B2C, C. V. Tomy, L. J. Chang, D.McK. Paul, N. H. Andersen, M. Yethiraj, Physica B 213, 139-141 (1995). Superconductivity in RNi2B2C (R=Rare Earth) Compounds, C. V. Tomy, L. J. Chang, G. Balakrishnan, D. McK. Paul, Physica C 235, 2551-2552 (1994).